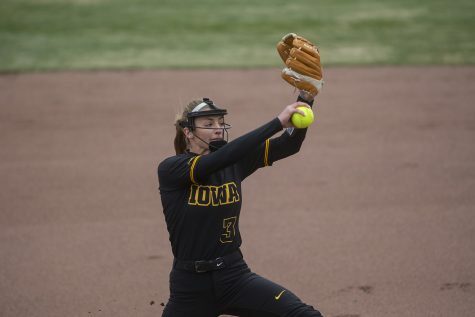 A pregame meeting sparked the Hawkeyes' offensive spark against Illinois. Iowa infielder Donirae Mayhew prepares to swing the bat during the game against Illinois at the Bob Pearl Softball Field on Saturday, April 13, 2019. 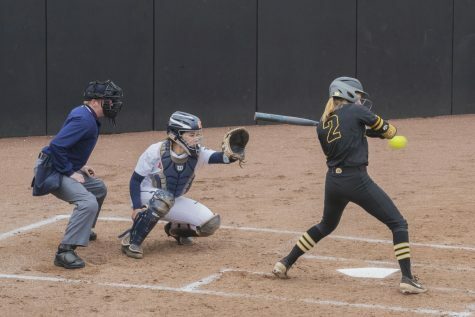 The Hawkeyes defeated the Fighting Illini 4-3. 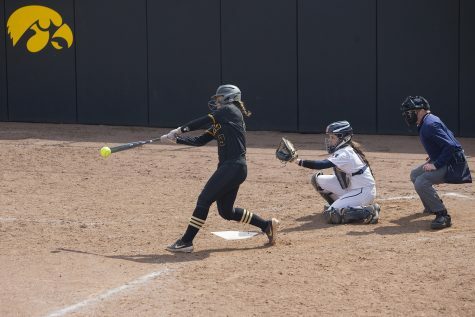 Offense has been hard to come by for the Hawkeye softball team. That is probably a gross understatement, actually. 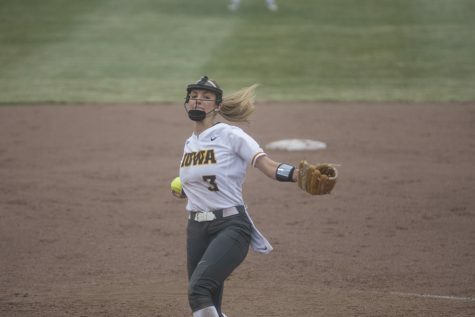 Before Iowa’s doubleheader against Illinois on April 13, it had managed just 8 runs in its last 10 games with only 30 hits. Those aren’t the numbers of a winning team, and that was evidenced by Iowa losing all 10 of those games. But something changed on against the Illini on April 13. 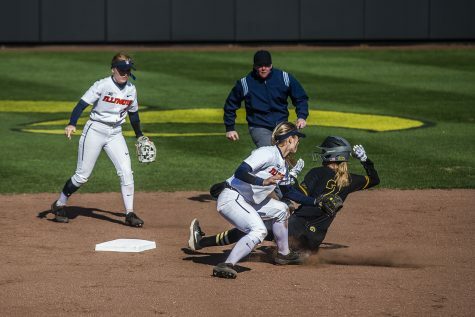 In the 15 innings the Hawkeyes played, they amassed 15 runs on 16 hits. 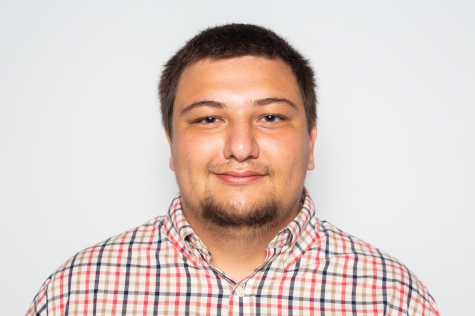 To put that in perspective, Iowa had 14 runs in its previous 13 games combined. So, what was the difference? A team meeting the morning before the doubleheader. It certainly helped Mayhew, who finished the day 4-for-6 with 2 solo homers. 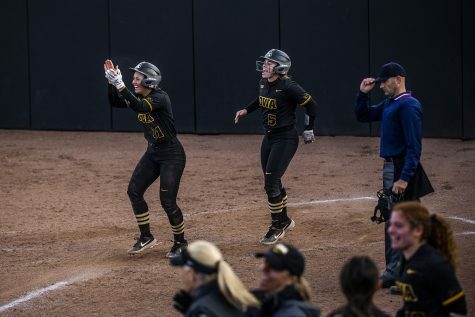 Perhaps the most impressive part about the Hawkeye’s “pow-wow” before the game was that it was not drummed up by head coach Renee Gillespie. After April 12’s slaughter rule loss to open the series, Gillespie said her team needed to fight more and be aggressive. That was the major change the team meeting had on the team. 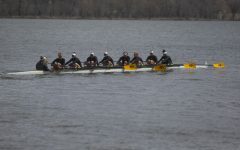 The Hawkeyes showed their resolve. After blowing a 9-4 lead in Game 1 of the doubleheader, they kept their composure going into Game 2. 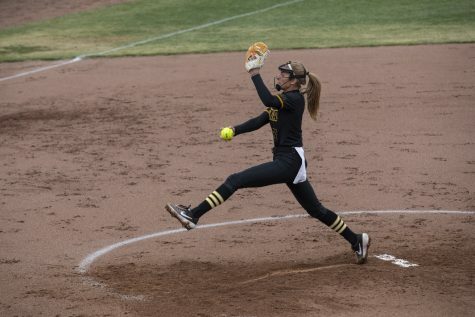 They kept it up after down most of the game and heading into the final inning down 2 facing Illinois ace Sydney Sickles, who had given up just 1 earned run in nine innings up to that point in the weekend series. 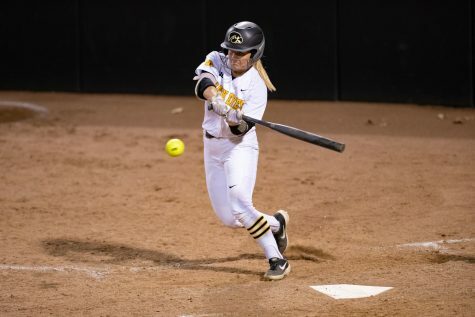 Trailing 3-1, Iowa fought its way back into the game with a game-tying 2-run double from Aralee Bogar. After the game, the sophomore parroted what seemed to be the theme of the Hawkeyes’ pregame meeting. 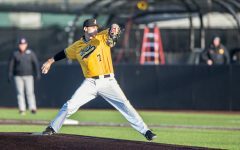 It may have proved to be a crucial win for the Hawkeyes as they prepare to embark on the easier part of their schedule. 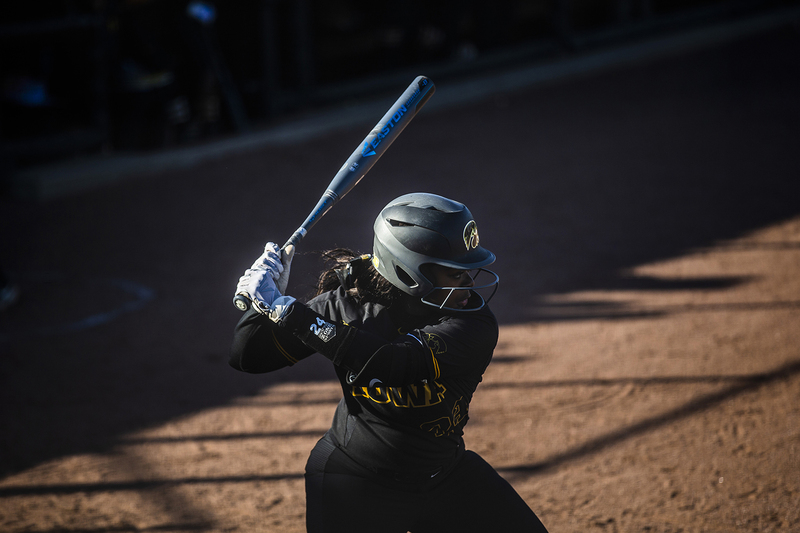 The day proved to the Hawkeyes not only that they can hit, but that they can hit in clutch situations. 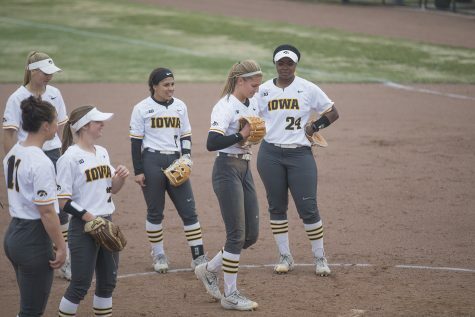 Iowa’s next game will be against Drake in Des Moines on Wednesday, with the first pitch coming at 6 p.m.